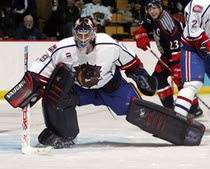 The Montreal Canadiens signed Carey Price, the team's 1st round pick in the 2005 NHL draft to a 3 year contract on April 10th and assigned him to the Hamilton Bulldogs of the AHL. The Habs goaltender of the very near future was quickly given 2 starts as the regular season ended, stopping 56 of 59 shots. Media covering the game were very impressed with his size, anticipation, composure and puck handling abilities so fans of the Montreal Canadiens will be watching the AHL playoffs closely to see if Price gets to play so soon after making his pro debut. The 6'03, 222lb goalie spent the past 4 seasons with Tri-City of the Western Hockey League. Scouts who have been monitoring Price say he plays a "Hybrid" style, combining both the stand-up and butterfly style to cover much of the net while remaining mobile. The Montreal Canadiens have won their 24 Stanley Cups by having a tremendous record of successfully scouting, drafting and developing goalies and have proven over the years that winning teams build from the net out. The incredible maturity and composure of Carey Price will have him on the fast track to Montreal, likely after just 1 year in Hamilton. Indeed, a major piece of the Canadiens future is knocking on the door.